The winners of the first year maths table quiz were Hannah Daly, Cian Molloy, Daniel Egan, Ryan Casey. Thank you to all the teachers and TY students who helped organised the quiz. Six representatives from the student council, Feidhlim Maher, Ali O Connor, Zoe Guinane, Saoirse Mc Loughlin, Daniel Egan and Joseph Carrigy attended the Comhairle na nÓg in the Longford Arms Hotel on Thursday 18th October. A very enjoyable day was had by all. Past pupil Shiona Cahill was a guest speaker on the day. Well done to Feidhlim Maher, Daniel Egan and James Carroll who were elected onto the Longford County Comhairle committee. The TY groups have swapped over timetables and will now experience a range of new subjects. Alan Devine presented a workshop on communication and public speaking to T.Y.1 students. Everyone had a great day and learnt some valuable new skills. He will be back in November to work the other T.Y. students. On Tuesday 24th all Ty students went to Tuard Ard Moate for a one man comedy show, “Psycho Spaghetti” performed by Ger Carey. This show looks at the working inside the mind of a teenager. Thanks to Ms. Flannery, Ms. Quinn and Ms. Bohan for accompanying them. Thanks to Dearbhaile Rooney, Claire Beirne, Blathnaid McDonagh, Chloe Molloy, Cora Norton, Paddy Conlon, Ali O’Connor, Rebecca Gill and Zoe Guinane who visited the Day-care centre last week. TY students, Ciara Mulligan, Jill Dennehy, Niamh Dempsey, Ellen Shannon and Laoise Nerney are putting together an anti-drink/drugs ad for a competition which is being run by the Longford Garda. Sean Mulleady, Mark Mealia, Patrick Conlon and Ciaran McDonnell are busy preparing an art piece for the school art exhibition “Imaginations run wild”, which will be held in the school on Thursday 23rd of November at 7pm. 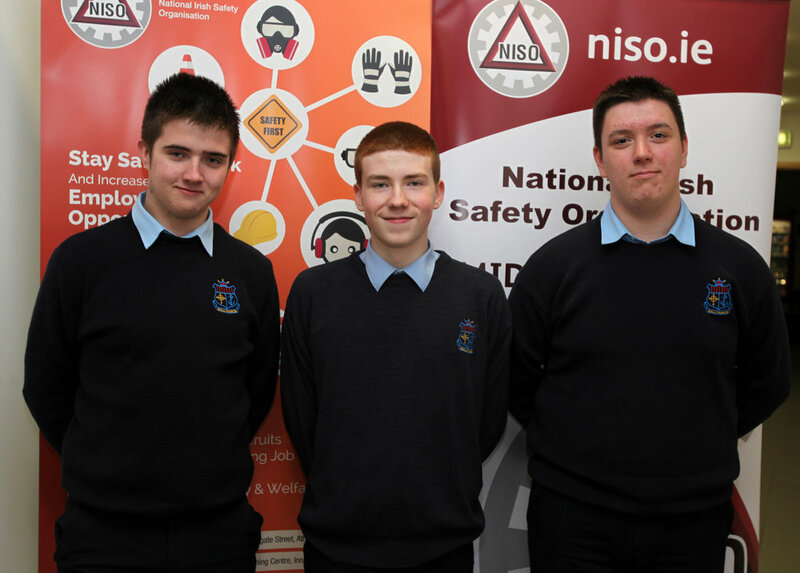 Well done to Joseph Kenny, Maciej Gorski and Matthew Jordan who took part in a Health and Safety Quiz run by the NISO in A.I.T. recently. Thanks to Ms. Bohan for accompanying the team. Congratulations to the U16 and U19 boys basketball teams who both won their matches against Coláiste na Hinse on the 24th of October. The U16s won on a score line of 48-17 points. The U19s had to work much harder. The game twoed and froed throughout and with 30 seconds to go our lads were down by 2 points. Some exceptional team play led to captain Neil Kilbane's shining moment, equalising with only three seconds left sending the game into extra-time. It was in extra-time that the Ballymahon men showed their true class outplaying the opposition in every facet of the game. After the additional time, Ballymahon finished the victors of this exceptional game 62:55.Well done to their coaches Mr Dempsey and Mr. Walsh. Congratulations to our Concern debating team of Arron O’Connor, Denny Hebron, Emer Tyrell and Amy Cox who won their debate against Borrisokane Community College in Tipperary on Monday 23rd. Thanks to their mentors Ms O’Reilly, Ms O’Donovan and Mr Staunton. Thanks to all who supported our annual School Walk on Tuesday 24th of Oct which helped to raise money for the school. To date over 2600 euros has been collected. The difference between a successful person and others is not a lack of strength, not a lack of knowledge, but rather a lack of will. (Vincent Lombardi).